Nice to hear from you again. We are currently in the process of building RC1. Will be uploaded within a day or two. does it have cfdisk as the original arch installer? or do i have to simply use fdisk? Thank you for your reply. I will wait with impatience of your masterpiece! 😉 Speaking about 1.05 then you want to see a solution to restarting X server with the keys Ctrl + Alt + Backspace. I switched from FM Thunar ещ PCmanfm because with PCmanfm immediately visible NTFS partitions. And the rest – thank you for the work. And please remember – I shall be glad to help! We will continue to use thunar as long as long as no “real advantage” appears for us to make a switch to pcmanfm! We are happy thunar users and it works brilliantly for us. well, thunar is imho the right choice, pcmanfm doesnt alert of low disk space and writes it until the disk gets full, and also it sometimes hangs and in my case unmounts my usb key 😦 when file copying is slow to the pendrive. Absolutely hot looking.Cant wait for it to be released. Pcman or Thunar doesnt make a big difference to me,,as long as it works,,They both have there advantages. I agree. 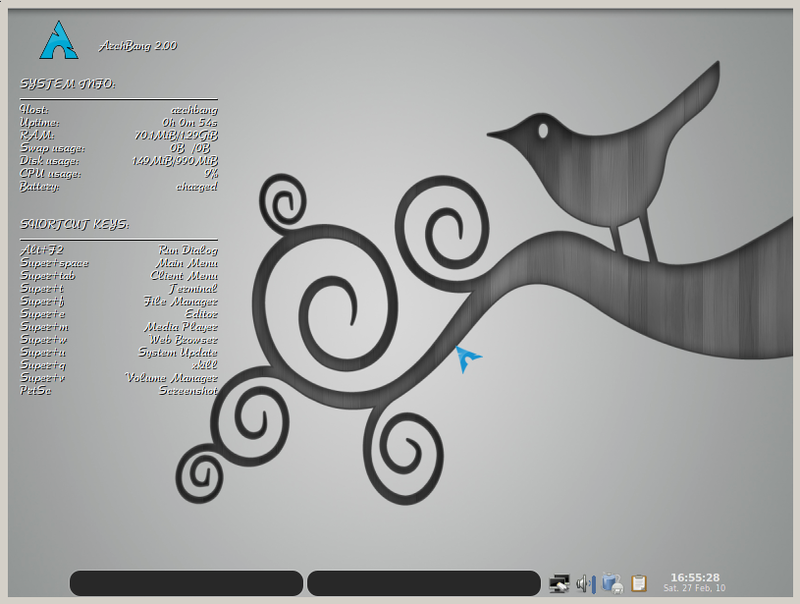 Personally I prefer Thunar, but what would Linux be without choices? PCmanFM is also a fantastic choice though, too. can i go through an advanced mode to install grub to other external storage? Sure just keep an eye on Grub install step,it asks for the mbr to be entered manually. anyway would this safemode also be listed in grubmenu after install? kernel upgrade is gonna b dangerous right? i see here u have posted the fix of the nvidia driver prob, and the /home with ext4 prob that the guy reported in the archfourms did not happen to me. Just tried on Thinkpad R61, intel 64 cpu and graphix. Would only boot to desktop with vesa, only to login prompt with ‘default’ and ‘intel’. Haven’t installed yet or checked network but wireless wasn’t picked up as (I am assuming no support) intel 4965(?) card. Looks good though. I will test more when I have time. Might even check on macbook pro! Keep up the good work, been looking for something like this for a while. This is fantastic- I’ve used #!, Ubuntu, ArchLinux (From scratch), etc… You guys need to setup a way to give donations for futher development / etc… Would be happy to pitch in for a domain name and a hosting or something if you’d be interested, shoot me an email if so- otherwise keep on keepin’ on! 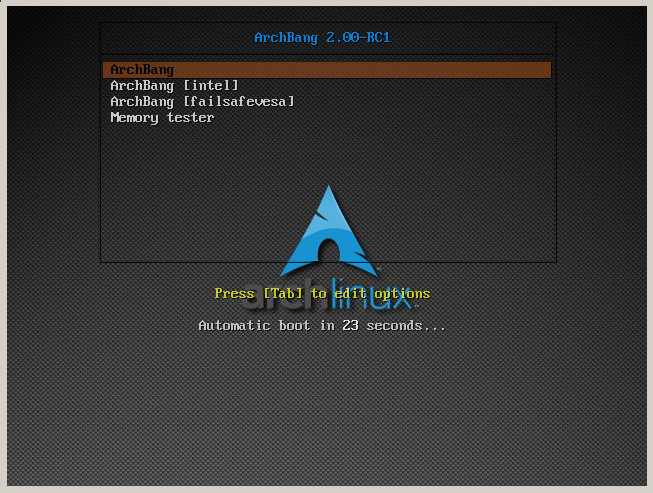 I’m in the process of testing the ArchBang installer and noticed that the 10-keymap.fdi file doesn’t exist. Wouldn’t it be better to have it there but just set to the default (us) keymap? does this stuff work under GNU/GPL licence? Of course. 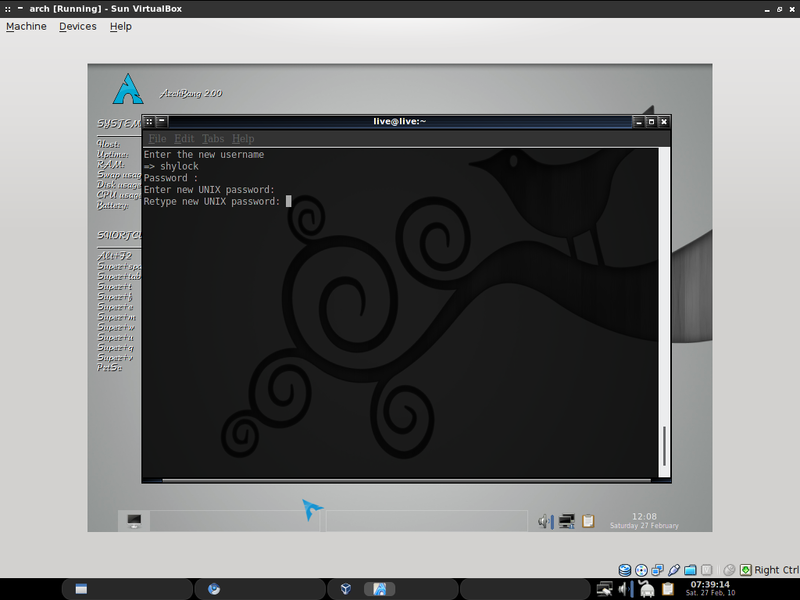 All License and everything are kept intact as you find in Arch Linux.